Thanksgiving is just around the corner! 🦃 Here’s a card filled with Fall colors to say how thankful you are for all the wonderful people in your life. The larger leaf stamps are from the Simply Stamped Leaves set by Taylored Expressions. (There is also a die set for the leaves you can find here.) The smaller leaf is one I’ve had in my collection for a long time and it didn’t have the company name on it. I stamped the leaves randomly on white card stock with brown, pumpkin, and gold ink. Then I lightly sponged the edges of the panel with brown ink. I layered the panel to brown card stock and attached the panel to a gold card. I stamped the acorns from the Acorny Thank You set from Stampin’ Up with brown and pumpkin ink on white card stock and used the acorn builder punch to punch them out. They are attached to a circle of orange card stock – the top one is attached with foam tape. The entire circle is attached to the card with foam tape. The sentiment is also from the Simply Stamped Leaves set. I stamped it with brown ink on white card stock, punched it out with an oval punch, and inked the edges with brown ink. It is attached to the card with foam tape. Here’s a tip if you are stamping your own background paper like I did. Stamp an entire sheet of 8-1/2 by 11 card stock with your pattern. Then you can easily cut the card into panels the size you need for your cards. 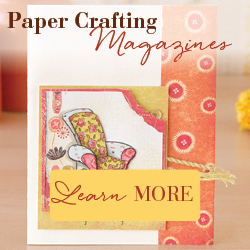 You’ll have enough for at least 4 cards – more if you’re using smaller strips of patterned paper.